Learn the value of thinking creatively! Fully illustrated Book, for ages 2-7 ** Read it FREE as part of your PRIME or Kindle Unlimited membership ** “The Creative Pony” tells the story of Arrow, a young pony that lived in a big farm in North Dakota. Arrow’s best friend was Angel, a beautiful pink pony. “I’m bored,” complained Arrow. “There is nothing interesting to do here.” Angel, on the other hand, always found interesting things to do. She used to invent new games and activities. After a few adventures, Arrow learns to use his imagination and think about new things to do instead of being bored. Author Efrat Haddi is taking young children on a journey with Arrow while he learns a very important lesson. 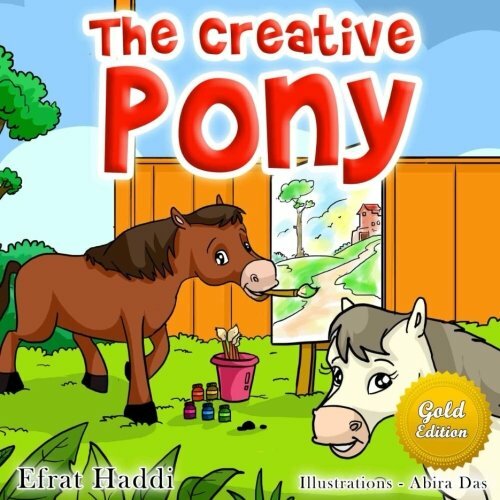 ” The Creative Pony ” helps to teach children an important social skill that can make home life happier and school more successful. It also provides parents, teachers, and counselors with an entertaining way to teach children why they should use their imagination. This well-written and inspiring story, delivers easy-to-digest education complemented by vibrant, delightful illustrations This story may be ideal for reading to your kids at bedtime and enjoyable for the whole family as well! It is suitable as a read aloud book for preschoolers or a self-read book for older children.